Wet wipes for soft and safe baby care. Contains pH regulating Lactic Acid, natural preservative and the skin careing agents Allantoin and Aloe Vera. The products are remoistening and normally not manufactured with perfume. Standard sizes: (length) 140 – 200 mm x (width) 200 mm. No of wipes per cu: 10 - 80 pcs. Refreshing wipes for all type of use. The lotion is remoistening, mild and fresh. practical and easy to use during all type of activities. No of wipes per cu: 10 - 25 pcs. 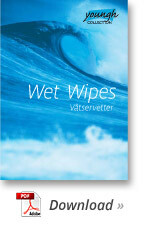 Wet wipes for daily intimate and hygiene use. Contains pH regulating Lactic Acid, natural preservative and the skin careing agents Allantoin and Aloe Vera. Remoistening and non perfumed. Standard sizes: (length) 140 – 270 mm x (width) 200 mm.